“It all started when an official of the Sai Trust announced that the godman would make a ‘moon appearance’ 6-7 p.m., and asked devotees to proceed towards the airport”. Few incidents are more telling against Sathya Sai Baba and his devotees than the "darshan on the moon" incident, which received enormous coverage, both in the Indian press and the naive websites which promote Sathya Sai Baba at all costs, always without a single breath of questioning or critical thinking and never a link to any dissident articles, websites or blogs. 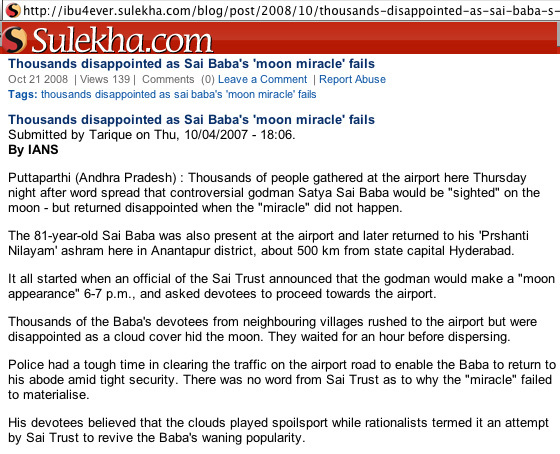 The single most searched main news item that has concerned surfers interested in Sai Baba issues (i.e." moon miracle" with "Sai Baba") was for years the remarkable October 4 failed miracle that was announced hours beforehand by Professor Anil Kumar to the crowd in Prashanthi Nilayam - namely, that Sathya Sai Baba said he would appear on the face of the moon and that he would give 'vishwarupa darshan'. This was to be seen - strangely enough - from the Sathya Sai airport in Puttaparthi. Crowds of a couple of hundred thousand devotees and other - many of them villagers from surrounding areas - turned out within hours and were so unruly that Sai Baba could not even reach the podium to give darshan, remaining stuck in his car for about one hour. Needless to say, no miracle of any kind occurred - the moon remained invisible behind clouds. It was later announced by the ashram authorities that the miracle was "postponed". That attempt at damage limitation thrpugh postponement into the uncertain future was sa way to mollify many of the believers. All manner of mental contortion was tried to avoid the reality, one fanatical apologist blogger - Gerald Moreno, who was himself nowhere near India at the time - claims that Sai Baba never even said he would appear on the moon even set out to prove that no such things were even promised! He did not explain, however, why hundreds of thousands flocked to the airport? Or why so many others claim that Sai Baba actually did appear on the moon's face! If it was not announced from the veranda by Sai Baba's very close servitor and translator Anil Kumar, why then was it later also officially announced as having been "postponed"? The answer, my friends, is blowing in the wind! Moreover, Sathya Sai Baba’s chief translator, Professor Anil Kumar, has acknowledged the extraordinary traffic and crowd snarls occasioned by Sai Baba’s trip to his private airport at Puttaparthi. Yet 20,000 people or so (some report 14,000, but no one really ever actually counts these crowds) rushed to the airport expecting a moon miracle? It's interesting how the Sathya Sai Organisation, Radio Sai and all the official and semi-official Sai websites avoid the issues with the veritable "silence of the grave". Wonder why? Not a word to confirm or deny anything! The failed moon miracle issue is very prominently reported in Indian press reports and on many websites and blogs. “Vishwarupa Darshanam“ is a beholding the universal form of the divine (by whatever means it is mediated – such as written in the Bhagavad Gita account of Arjuna’s looking into the mouth of Sri Krishna). Sacred Hindu scriptures state that it is grace extremely rarely bestowed. Supposedly, Sai Baba, who claims to be the fullest incarnation of God ever to appear on earth (poornavathar, purnavatar, etc) was going to allow thousands of his devotees to have the vision of the cosmic form of the divine (in whatever that may consist). Not one poor soul is reported as having received that greatest divine vision possible, the Vishwarupa darshanam that Krishna supposedly gave to Arjuna. “The near stampede at the aerodrome compelled the ashram trustees and the Seva Dal volunteers to shift his vehicle to a remote corner and form a security cordon around it. But the devotees kept chasing Saibaba’s vehicle wherever his car moved …. 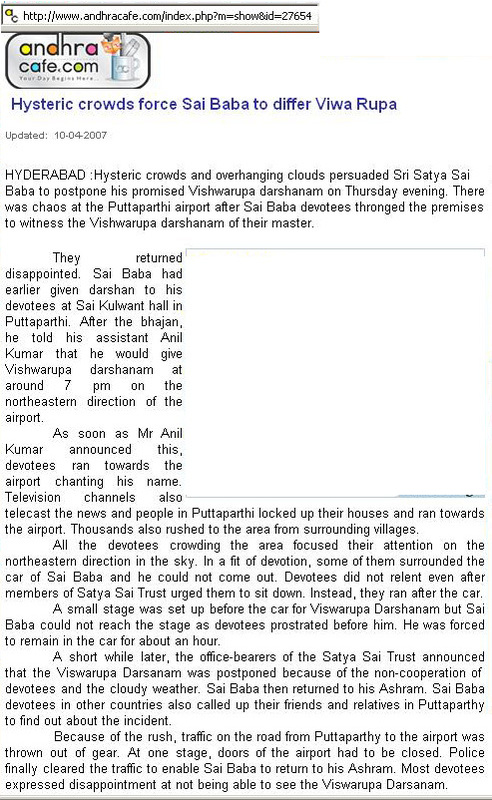 A vexed Saibaba and his entourage them decided to get back to his abode of Prashanti Nilayam. “Even that was difficult as the entire road and the highway out of Puttaparthi was clogged with vehicles,” said Anil Kumar, Baba’s disciple and personal attendant …. Thursday’s aborted feat is being seen an attempt by the aging godman to regain his waning popularity and rekindle public interest in his divine personality. Saibaba’s vast properties in Bangalore, Mumbai and Delhi are already under a cloud with rival groups within the Trust demanding a stake in the assets”. Vivek Kumar wrote on his blog:- "Yes it happened last night—Sri Sathya Sai Baba did appear in moon last night, and my friends have reported to have seen Him at around 11:00 PM (IST). Yes dear friends, after the earlier declaration that he would show his Vishav Virat Roop (Cosmic Form) to the crowd at the Puttaparthi Airport, it has been done last night. Many people were agog with the words that “Sai Baba’s Moon Miracle Failed”. However, it is been done now and we can revel the mystery of this Avatar." And there were 3 comments: 1) vikiiiiiiii said... Even my parents and friends told that they saw saibaba in moon...every one was wonder stuck 2) Anonymous said... Swami has appeared in the moon tonight as well around the same time as Monday night. Amazing. 3) Rajavelu said... Yes we too have seen this in Abudhabi too. Student devotees and other immature persons sent e-mails out - including to an ex-devotee - with a constructed image of Sai Baba on the face of the moon as a representation of what was actually seen (it is claimed!). Everyone involved having signally failed to photograph such a stupendous event (suspicious in itself), its originator says he 'created' it - it is clear that used and altered an image of Sai Baba he took from elsewhere and superimposed in onto a manipulated full moon. 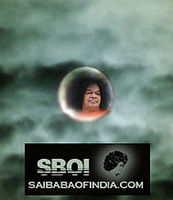 He has claimed he and his family/friends actually saw the face of Sai Baba on the moon very like the image! What hope or help is there for anyone who actually believes what an entire world - including many thousands of astronomical telescopes - have not so much as mentioned once (even by Sai Baba's nuclear physics professor, Dr. G. Venkataraman, who doubles as the semi-pro interpreter of astronomical phenomena as all being divine Sai Baba events). How can these 'miracles' apparently occur, but only for a handful of people, while astronomers around the world see absolutely zilch? (I can almost 'hear' some devotees thinking "Astronomers and star-gazers are unworthy people who are therefore not granted this blessed darshan". But then again there were the 200,000 devotees at the airport who did not get it either). “The human brain runs first-class simulation software. Our eyes don't present to our brains a faithful photograph of what is out there, or an accurate movie of what is going on through time. Our brains construct a continuously updated model” and.... “Constructing models is something the human brain is very good at. When we are asleep it is called dreaming; when we are awake we call it imagination or, when it is exceptionally vivid, hallucination. As Chapter 10 will show, children who have 'imaginary friends' sometimes see them clearly, exactly as if they were real. If we are gullible, we don't recognize hallucin­ation or lucid dreaming for what it is and we claim to have seen or heard a ghost; or an angel; or God; or - especially if we happen to be young, female and Catholic - the Virgin Mary. Such visions and manifestations are certainly not good grounds for believing that ghosts or angels, gods or virgins, are actually there.On the face of it mass visions, such as the report that seventy thousand pilgrims at Fatima in Portugal in 1917 saw the sun tear itself from the heavens and come crashing down upon the multitude', are harder to write off. 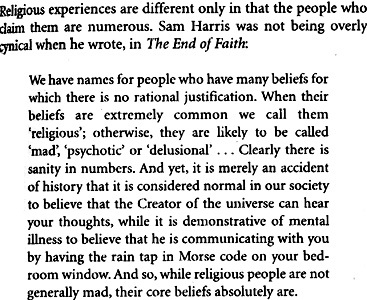 It is not easy to explain how seventy thousand people could share the same hallucination. But it is even harder to accept that it really happened without the rest of the world, outside Fatima, seeing it too - and not just seeing it, but feeling it as the catastrophic destruction of the solar system, including acceleration forces sufficient to hurl everybody into space.” From ‘The God Delusion’ by Richard Dawkins, p. 115.This moon madness episode - incredibly bungled deception propaganda - is the latest in a lifetime of deceits by Sathya Sai Baba.